The large pine weevil Hylobius abietis (L.), LPW, is a major pest of trees in replanted coniferous forests in northern Europe. 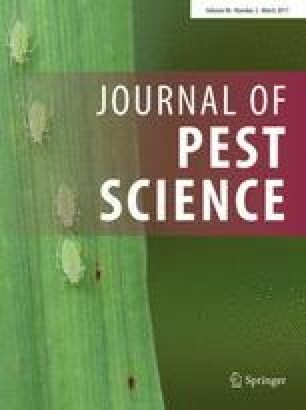 The use of entomopathogenic nematodes (EPNs) applied against developing stages for population suppression is increasingly recognized as an effective alternative to plant protection using chemical pesticides. Here, we report results from a series of trials we conducted over 2 years using two species of EPN, Steinernema carpocapsae (Weiser) and Heterorhabitis downesi (Stock, Griffin, and Burnell) with different foraging strategies. Trials were conducted at lodgepole pine sites in Ireland on both mineral and peat soil type. EPN suspension was applied to the stumps of felled pine trees, and EPN efficacy was determined afterwards by directly assessing parasitism rates after debarking one quarter of the stumps and by collecting emerging adult weevils from traps erected over other treated and control stumps. Our results suggest that both species of EPN are equally effective in suppressing LPW populations to below the current, informal thresholds of economic damage. EPN were equally efficient in controlling LPW in peat and in mineral (lithosols/regosols and acid brown earth/brown podzolics) soils. Weevil density and distribution within pine stumps in peat versus mineral sites can explain patterns of LPW parasitism and suppression. Our results also suggest that infestation level (number of weevils per stump) can be an important factor in forecasting EPN application success as there is evidence of negative density-dependent parasitism when weevil densities were high. The online version of this article (doi: 10.1007/s10340-016-0823-y) contains supplementary material, which is available to authorized users. We thank Abigail Maher for technical support, and numerous forest managers and technicians from Coillte, Ireland, for providing access to sites and helping with trials. This research was funded by the BIOCOMES project co-funded by EU FP7. This research was funded by the European Union FP7 under grant agreement n° 612713 (BIOCOMES project). LM was supported by the Irish Government (Department of Agriculture, Food and the Marine) under the National Development Plan 2007–2013. All authors declare that they have no conflict of interest. This article does not contain any studies with animals performed by any of the authors.